ILKESTON Town's promotion-winning coaches could be snapped up by another club amid uncertainty at the New Manor Ground. Paul Hurst and Rob Scott have become hot property after steering Ilkeston Town to the Conference North with a play-off victory. Leading non-league club officials have been impressed by the way they tackled the job of taking over from manager David Holdsworth, who left in December. They managed the squad while still on playing contracts, with Hurst completing every league game at left back and Scott directing operations from the touchline. They hoped to be offered management deals to guide llkeston through their first season in the Blue Square North, with the club only two promotions from the Football League. But talks have not begun and Hurst said: "This has been disappointing and frustrating. "I am not sure it would happen at too many football clubs or too many workplaces, to be honest. "We had success and when you have success you start to build your reputation. "People are always interested in players who are successful. Chairmen will be interested in managers who have enjoyed success. "We have proved our worth in a difficult situation," added Hurst, who is a long-standing favourite of fans at Division Two side Rotherham United, where he spent the bulk of his full-time playing career. Scott, whose Football League career included a successful spell at Fulham, has done coaching work at Newcastle United. Holdsworth brought the pair to Ilkeston in the summer, as he rebuilt the side from scratch. Only striker Jon Douglas survived from the squad left by Nigel Jemson. 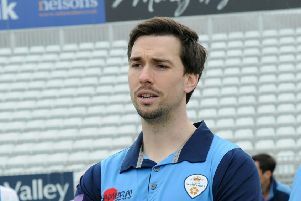 When Holdsworth went to Conference Premier Mansfield, the pair showed a surefootedness in making signings which added to the side's attacking fluency. Centre-half and captain Simon Weaver, another key signing, headed the goal which clinched promotion in the 2-1 win over Nantwich Town in the play-off final at the New Manor Ground on May 2. The pair had each booked fortnight holidays - but were ready to spend the rest of the summer in developing the squad for the challenges ahead. Hurst added: "I feel sorry for the fans and people at the club. They had the high of going into a higher division and we then have these uncertain times. We are grateful for the support. "We have had a few calls from players, wanting to know if we have got the job. It would also be nice to know what budget we would work to."